Butterflies had always been every camera persons interest because of their vibrant colors and delicate appearance. 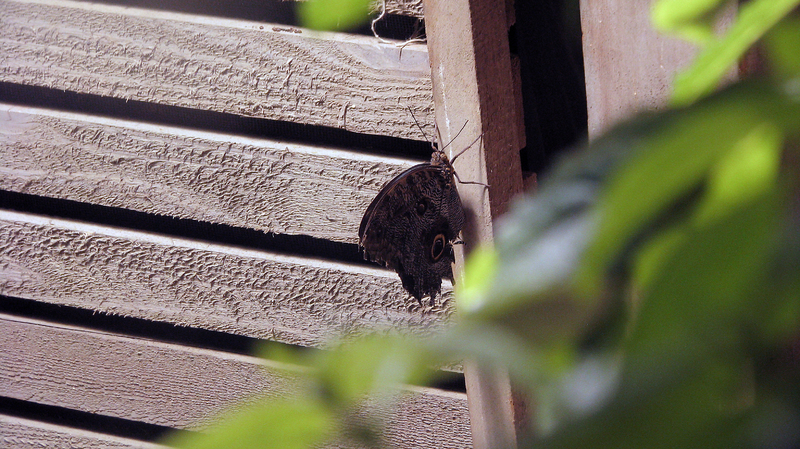 This common brown garden butterfly now lives in a green house. The contrasting brown and green colors of the picture are its beauty. The butterfly together with wooden frame and bright green leaves in the foreground created a great impression. The picture is taken in the Aperture Priority mode to focus on the butterfly in neutral light. Since it is an indoor photograph, the photoshop Auto Color option is used to get rid of the yellowish tint of the lights in the green house. The Unsharp Mask option is used to emphasize the texture and details of the butterfly and the woods in the background.